Michael and Margarethe Adler with their family from Viernheim take over the former Hugel inn and the butchery in Lindenstraße in Bonndorf. The son Hans Adler and his wife Liesel take over the butchery and inn. The range of sausage products is increased. In the 50s the mail order business with Black Forest smoked products commences. 1959 is the birth year of Black Forest ham: ADLER starts selling its most famous product, created by using a recipe that’s well over a 100 years old. Salting, curing and smoking was used to preserve meat when home slaughtering was still common practice. The traditional procedure not only prolongs the ham’s shelf life, it also adds to its typical rich aroma. Adler inn is closed. The abattoir and meat cutting plant is erected on the present-day company premises. Founding of Hans Adler OHG Schwarzwälder Fleischwaren. The son Peter Adler becomes co-partner and systematically promotes the production of smoked products. The logo with the “ADLER”-rhombus becomes a trademark symbol. The manufacture of Burehäxle (knuckle of pork) and Schäufele (shoulder of pork) commences. Hans Adler leaves the company upon reaching retirement age (+ 1976) and the son Hansjörg joins the family-owned company as a partner. The first portion of sliced Black Forest ham in Germany leaves the production line in self-service packaging. An air-matured ham, with the name “Alemannian ham”, is added to the product range. ADLER acquires Kinzigtäler Fleischwaren GmbH, Haslach and Schwarzwaldrauch GmbH, Achern, which subsequently is renamed to Schwarzwaldfleisch GmbH. Filligrano – the thinly sliced and mild smoked bacon is launched. The specialisation on ham products is further promoted by building up a pure ham business in Achern and by founding Schinkenhof GmbH & Co. KG. In 1997 the European Union registered “Black Forest ham” as a “protected geographical indication”, for the protection and appreciation of agricultural foods of a special character and foods with protected designation of origin. Under the “quick cuisine” (convenience foods) trade name, sliced pork sausage was introduced to the market. A variation of this is the Strasbourg sausage salad with cheese. Landjäger (spicy smoked sausage), the spicy sausage snack in an angular shape, was the first product to be launched on the market in self-service packaging. The Hans Adler OHG and Schinkenhof GmbH & Co. KG have been certified in accordance with the International Food Standard. Schäufele, extra lean cooked shoulder of ham, is a genuine ready-to-eat treat and can be served both hot and cold. Cut into slices, Schäufele (shoulder of pork) is the ideal keep-fresh pack for small households. The “quick cuisine” brand is supplemented by other variations containing regional specialities – such as the Swabian and Bavarian sausage salad. Leberwürstle and Bauernbratwürstle (black sausage, liver sausage and farmer’s fried sausage) as well as the Black Forest Schäufele (shoulder of pork), served in a practical tray. In this innovative packaging, the Schäufele (shoulder of pork) can easily and simply be prepared in the microwave oven or in a water bath. 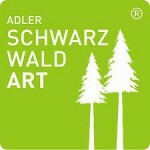 For the high-quality ADLER specialities and gifts Black Forest meat introduced the SchwarzwaldArt brand name. Invention of a sustainable new packing: ADLER 2FachFrisch. Two separate compartments provide fresh ham for a longer period of time while reducing foil wastage at the same time. Dr. Hansjörg Adler leaves the company; Peter Adler’s daughter Marie-Louise joins the company as shareholder.